FORT BELVOIR, Va. -- Deep in a large research facility tucked away in a secure corner of the base, scientists and engineers are working to see in the dark. The magic is made possible by technology and a team of smart individuals. "At night, it can be dark, but nothing is ever completely dark," said Staff Sgt. 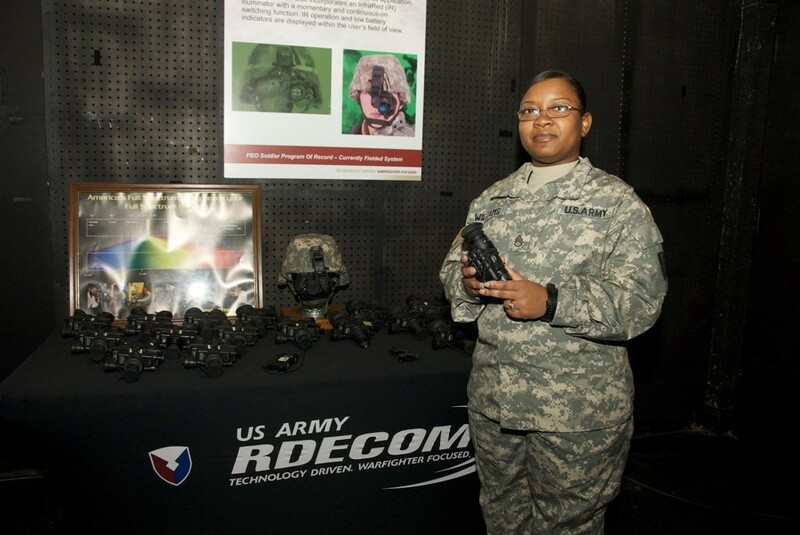 Milinda Williams, U.S.Army Research, Development and Engineering Command. "You always have some form of light whether it is the stars, the moon or some small artificial light." The moon is the brightest object in the night sky, but it gives no light of its own. Even at night, the sun dominates with its reflection on the moon's surface. With a bright moon and eyes adjusted to the scene, it is possible to see a lot at night. But the true magic of night vision is illumination of what seems to be complete darkness to the human eye. With a $3,000 night vision monocular device, Soldiers gain an advantage on the battlefield. The AN/PVS-114 Monocular Night Vision Device is fielded throughout the Army. "It operates with an image intensifier, which brings the light in through two mirrors, and it allows you to see the image of the enemy," Williams said. "We're able to function at night, and to maneuver at night, and be able to surprise the enemy, and not be surprised by the enemy." Night vision research began during World War II. In 1945, the U.S. Army developed an infrared sniper scope. But only 300 of the devices made it to Soldiers in the Pacific. Decades of research have netted huge advances in the technology. The Army now operates a full spectrum research center at Fort Belvoir where, researchers work on integrating night vision devices into weapons, surveillance and night driving and flying. Scientists and engineers are pushing the envelope to discover what's on the horizon. "It's great, but we continue to work on making battlefield conditions better and brighter," Williams said. "It's all about keeping our Soldiers better equipped." About 60 enlisted Soldiers are assigned to RDECOM research centers and labs across the nation. "Our noncommissioned officers are integral to our research and development," said Maj. Gen. Nick Justice. "Our NCOs and researchers are like the double helix in a strand of DNA. They work together to produce technology-based solutions for our Soldiers." "When they are developing some of the systems, they come to me for input on the fit, the weight, and whether the design is really a good idea," Williams said. In the basement of the night vision lab there is a 90-meter tunnel researchers use as a rifle range. Williams said she controls lighting conditions, such as simulated starlight, for testing night vision devices on weapons systems. She helped her team prepare the hands-on demonstration for a visit of Secretary of the Army John McHugh March 15. McHugh fired three rounds from an M-16 rifle using a night vision device in near complete darkness. "I think he enjoyed this part of the visit," Williams said. "It's going to be something he'll remember for a long time. Everybody likes putting hands on the equipment." Williams said she enjoys her job. She has worked at the lab for nearly two years. She repairs night vision devices and works with researchers to improve systems. With 15 years invested in her Army career, Williams feels she is making a difference. "I can actually see the beginnings of the system," she said. "That way, I know how it works and I see how I can impact the system before it gets to the Soldier."